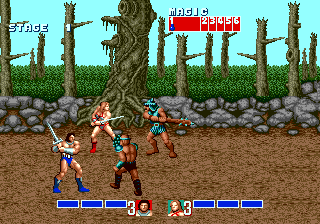 Golden Axe is a hack 'n' slash game that was released on Sega's 16-bit console in the same year as the Arcade original. There are three characters, Axe Battler (a barbarian), Tyris Flame (a female warrior) and Gilius Thunderhead (a dwarf) and each has their own strengths and weaknesses. There aren't many attacks you can perform but double tapping left or right on the d-pad makes your character dash ready for a flying kick. The controls feel stiff and it's difficult to pull off a series of attacks without the same enemy interrupting your combo with some shots of their own. There's also times when you're knocked to the ground and the second you get up an enemy will repeatedly knock you back down. If you attack the small thieves around each level they'll drop blue pots that give you the ability of magic; the more pots you have the more powerful your magic will be. In certain levels you can ride dragons that have attacks such as tail whips and fireballs. These are great fun and make combat easier as you can take out enemies from a distance. The main problem is that there are only seven levels, most of which can be beaten in a few minutes; there's also little variety in the stage settings. The graphics are a bit murky but they're okay for an early Mega Drive title. There are a few nice touches such as Tyris Flare's dragon attack, weather effects and the level where you're riding on the wings of a giant eagle. There's also a Duel mode which consists of 12 short battles against different enemies on static screens. You only have a single life so you must complete the whole thing in one go. It's a nice idea and a good way to challenge your skills without relying on magic and health items. Golden Axe is a well put-together game but it's too short and repetitive and hasn't aged as well as other Sega franchises like Streets of Rage and Shinobi. Still, give it a go if you're looking for a decent hack and slash game on the Mega Drive. Random trivia: A few of the game's voice samples were taken directly from big Hollywood movies, namely Conan the Cimmerian, and Rambo - First Blood!